It doesn’t do it justice to watch it in real time. Henry Ruggs III went out for what looked like a routine slant route under the assumption that the ever-accurate Tua Tagovailoa would throw him an on-target ball on first down. It wasn’t. Tagovailoa had to get the ball above LSU linebacker Patrick Queen, and the ball sailed on him. As a result, it was not only high, but it was behind Ruggs. Draped all over the Alabama receiver was LSU cornerback Greedy Williams, who’s considered one of the nation’s top cornerbacks. If Ruggs failed to make an effort on the ball, the LSU secondary might have had an interception. In a scoreless game on the road, Tagovailoa’s errant throw had the makings of a major turning point. Instead, Ruggs turned it into a video game-like highlight. The Tide sophomore elevated and with his momentum taking him in the opposite direction, he reached back with his right hand and hauled in a jaw-dropping catch. With Odell Beckham Jr. watching from the sidelines, Ruggs did his best Beckham imitation to stun the LSU faithful. Ruggs’ catch even earned him praise from Alabama’s toughest critic. “It was a great catch. 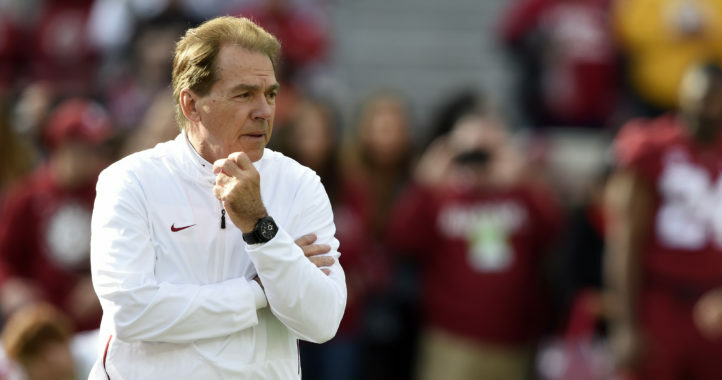 No doubt,” Nick Saban said on the SEC Coaches Teleconference. 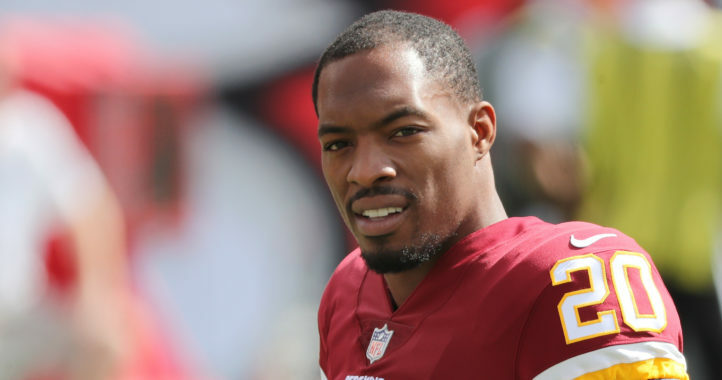 “Henry has been a really valuable player for us and he’s made a lot of explosive plays. I think he’s capable of making those kind of plays and those kind of catches. It was great to see it at that moment in time when we needed because it kept us going offensively early in the game. That it was. Fortunately for Alabama, Ruggs has been far more than video game-like flash in his sophomore season. 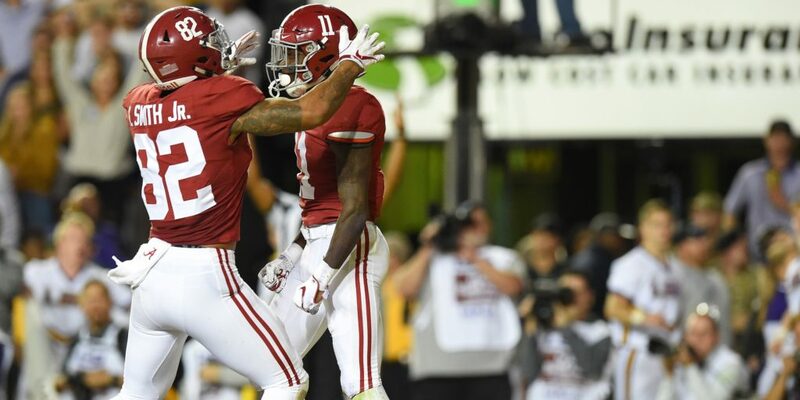 On that same drive with Alabama in the red zone in search of its first points, Ruggs got a step on Williams and caught a touchdown pass on a post route, despite the fact that All-American safety Grant Delpit came in over the top with the hit. An even scarier moment came later in the game when Ruggs was blocking for his fellow video game receiver Jerry Jeudy. Ruggs got tripped up and went down in pain. It sidelined him the rest of the way, but the injury didn’t turn out to be as serious as some feared. Saban said Wednesday that Ruggs was back practicing in full, which suggests he’ll be ready for Mississippi State on Saturday. That’s good news for Alabama because since Ruggs has been a regular contributor, he’s been an integral part of the Tide’s top-ranked scoring offense. He has scored a TD in 7 of the Tide’s 9 games this season. He also recorded at least 3 catches in 7 of 9 games this year. Compare that to last year, when his lone 3-catch came in the 2017 College Football Playoff National Championship. Just like he did against LSU, Ruggs got Alabama on the board in the title game. Against Georgia, all 3 of his catches from Tagovailoa came on consecutive plays in the third quarter. Not only were the 3 catches a career high, but they also tied him for the team lead with 6 touchdown catches despite the fact that he didn’t start a game as a true freshman. There’s a key difference with the 2018 version of Ruggs, though. A year ago, Ruggs and Jeudy averaged a combined 0.9 catches and 36 receiving yards per game. Ruggs was still hauling in touchdown catches — his streak of 5 consecutive games with a score earned him the nickname “Touchdown City” — but the volume wasn’t there for him or Jeudy. Now, Ruggs and Jeudy look to be as good of a duo as there is in the country. They rank second among Power 5 duos with 18 receiving touchdowns and they average a combined 153 receiving yards per contest. Obviously having a quarterback as historically prolific as Tagovailoa helps, but as Ruggs showed against LSU, he’s plenty capable of making his signal-caller look good, too. And that’s not just because the Alabama High School 7A 100-meter dash record-holder is the fastest player when he steps on to the field or because he can jump out of the gym (his high school basketball highlight video is something). The video game-attributes have been there since he stepped on campus. Still, the toughness and the route-running stand out with the former 4-star recruit. Certainly Saban appreciates Ruggs’ blocking ability, too. He’s no longer just “Touchdown City,” though touchdowns on 35 percent of his career catches probably won’t lose him that nickname. In the middle of his sophomore season, Ruggs is already eighth on Alabama’s all-time career receiving touchdowns list. On his current pace, he could be ranked as high as second on that list by season’s end trailing only Amari Cooper. 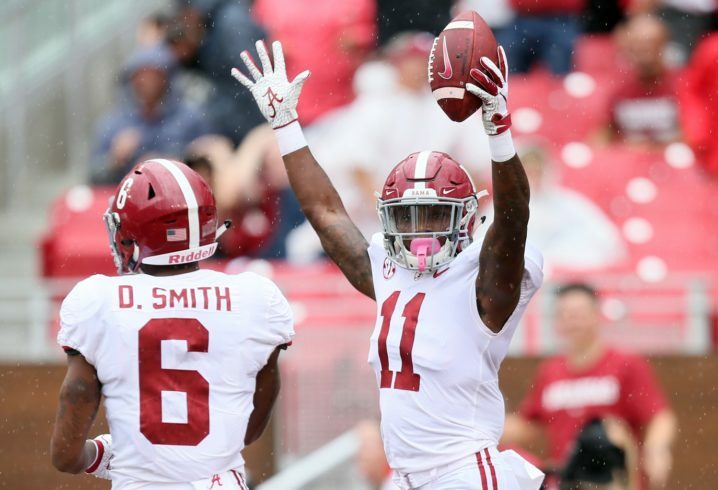 Ruggs and Jeudy are 3 scores from breaking Alabama’s single-season record for receiving touchdowns by a duo (Cooper and DeAndrew White had 20 in 2014). As loaded as Alabama is offensively, Ruggs’ health has been a popular topic of discussion leading up to the Mississippi State game. Maybe that’s because the Bulldogs have allowed the fewest passing touchdowns of any team in America. Or perhaps it’s for the simple fact that since Ruggs was named a starter in the beginning of 2018, he’s been rock solid for the nation’s top offense. He definitely made Saban look smart for putting him in such a prominent role early in his career. Tagovailoa would probably agree with the nation that Ruggs has a knack for making people look good. Alabama suddenly has a fantasy passing offense. It’s one that you have to see to believe. But yeah, Ruggs’ one-handed grab is still unbelievable. I hope we don’t see any of those Saturday. We will have enough problems just keeping it close. I can’t help but believe Foster and Simms would have had great numbers if Tua was the QB for them… Ruggs is playing great ball this year. That and Kiffin had a knack for targeting Cooper and ONLY Cooper. But you’re right, Tua is the type of QB who expands on a gameplan where other Bama QBs in the past didn’t have the ability to extend into the 3rd or 4th read quite as Tua does. He goes through his progressions very quickly. It’s nice seeing the TE make catches as well… Hurts seemed to never throw to the TE. That the guy that UGA made never see the starting position again…? Pretty easy to carve up a team that had no game film of you and did not prepare for you at all…Baker picked him off, bud. Should someone tell this clown that UGA was top 10 in defense last year….? 31 to Arkansas in 2018. That top 10 defense didn’t keep Tua from lightning that a$$ up…. And UGA still controls their own destiny and can afford the same # of losses as Alabama…No dodging the game this year! And Alabama gives up 31 points to terrible teams! UGA is reigning conference champions and has yet to be dethroned…Clinched before Alabama as well, we were waiting to see if you would try to dodge the game again this year! They clinched the same week dumba$$…. Bama is the defending NC… UGA is already sporting a 20 point loss to a west team. You better hope UGA doesn’t get swept by the west..